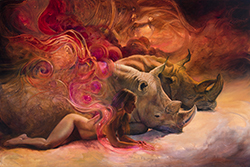 “The very fact that a large part of our brain is all about emotion and communication is proof that connection with others is a vital part of our survival.” This statement reflects the heart of Julie Bell’s work—expressing emotional connections in visual forms as a way of authenticating our common bonds. Bell’s journey began in Beaumont, Texas in 1958. The daughter of an architect and an artistic mother, she was encouraged in her artistic development as a child, as were her two younger sisters. At age twelve, however, life changed significantly when her parents divorced and Bell moved to Atlanta with her mother and sisters. The next few years proved peripatetic as she attended five different high schools, continually adapting to new environments and expectations. Despite these challenges, Bell was introduced to drawing classes during these years, and after graduation, she attended Dekalb County Community College in Atlanta where drawing became the focus of her studies. Looking back on that period of her life, Bell comments that she had “great teachers” at the Dekalb County Community College. It was there that she was first enrolled in the life drawing courses that would become the foundation of her later work. And she was introduced to color theory, a core component of a traditional art curriculum, and at the very heart of Bell’s painting style in particular. 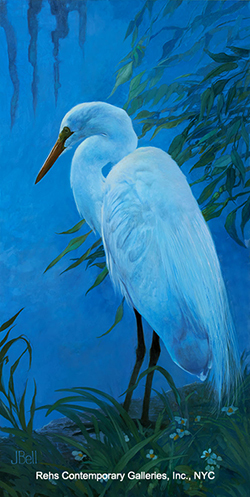 The next move was back to Beaumont, Texas where Bell’s father lived and where she enrolled in Lamar University, studying with wildlife artist and professor of painting, Jerry Newman (1934-2008). According to Bell, Newman’s courses were her “first serious life drawing study”. Building on the foundation that she had established in Atlanta, she deepened her drawing skills under the guidance of a practicing artist. Lamar University was also where Bell met Donald Palumbo, an English professor whom she married in 1978. Shortly after their marriage, they moved to Marquette, Michigan where Palumbo taught at Northern Michigan University in the upper peninsula—a dramatically different setting from either Texas or Georgia. Bell maintained her study of art there under the direction of the sculptor Wolf Niessen (1923-2004), who emphasized the importance of the psychological aspects of art. Perhaps more important to the young Bell, however, was the fact that Niessen took her seriously as an artist, even though she herself still felt uncertain. The years in Marquette were also marked by the birth of Bell’s sons, Anthony in 1980 and David in 1982. Not surprisingly for a new mother, Bell developed a particular interest in children’s books, and was asked to provide illustrations for two publications while she lived in Michigan. Although both books had only local distribution, the illustrations that Bell created for these books would prove to be an early indication of a career direction that she still occasionally pursues today. When the family moved to Ohio in 1983, Bell again registered for drawing classes, this time at Lorain County Community College in Elyria, near Cleveland. In addition to art courses, she turned her attention to bodybuilding and powerlifting during these years, eventually achieving a national ranking as a competitive female bodybuilder. Four years later, the family moved again, this time to Chambersburg, Pennsylvania, and Bell enrolled in art classes at Shippensburg University where her husband was then teaching. By this time, however, the marriage was fraying. Divorce followed and Bell began an entirely new phase of life, raising her sons and continuing to compete in national contests as a bodybuilder. 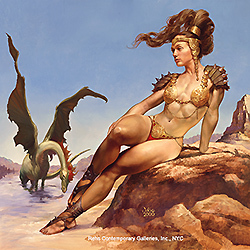 When one of the competition promoters suggested that she might be interested in modeling for an artist named Boris Vallejo (b. 1941), Bell agreed. During those modeling sessions, Bell observed Vallejo’s approach to painting, how he used color and what techniques he employed in the process. Subsequently, she decided to ask for his opinion of her own art work. His response was a suggestion that she slow down and be more patient with her own drawing, taking the time to think more thoroughly about what she hoped to express. That was the beginning of a more considered artistic process that led Bell into her mature work. Ultimately, Vallejo became both her painting teacher and her partner. They were married in 1994. As she began to take herself more seriously as an artist, Bell started photographing her own models for her paintings. In the late 1980s, one of her models was posing for an album cover, and asked Bell if she would also create a painting from the photo. 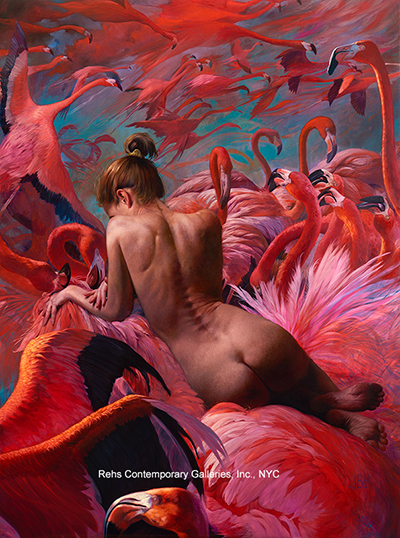 Although the painting was not chosen for the album cover after all, it did catch the attention of the British publisher Hubert Schaafsma of Paper Tiger Books, who particularly admired the way that Bell had utilized shiny chrome textures to paint a living creature. 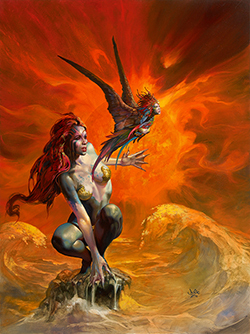 Ultimately, the image became the cover for an issue of Heavy Metal in 1990; and she created a portfolio of twenty fantasy paintings with “metal flesh” as a theme. The 1990s were a productive decade. After the success of the “metal flesh” paintings, Bell decided to approach Marvel Comics about the possibility of illustrating some of their publications. From 1990-1996, she was one of Marvel’s regular illustrators, becoming the first woman to paint the covers for Conan. In addition, she illustrated many of the trading cards from that period, including those for the Silver Surfer and Iron Man. It was a reliable income and useful experience in working for a large corporation. Similarly, the Franklin Mint hired Bell and Vallejo together to produce an annual image for a series of commemorative sculptures. Because the company’s production facility was still based in Pennsylvania in the 1990s, Bell and Vallejo were able to work collaboratively on site with the sculptors who would translate their paintings and drawings into three-dimensional forms. Bell and Vallejo also collaborated on projects for major advertising campaigns beginning in the late 1990s. Clients included Ford Motor Company, Nike, Coca-Cola, Toyota and Proctor & Gamble’s Old Spice line. Bell’s paintings may also be seen on three of Meat Loaf’s album covers including his 2016 release, Braver Than We Are; and as the poster for the the 2007 animated film Aqua Teen Hunger Force. As the millennium approached, Bell persevered in exploring new directions and ideas. 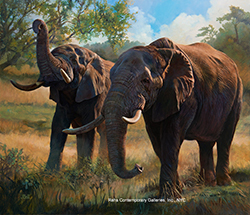 With both of her sons studying at the Pennsylvania Academy of Fine Arts by 2001, she absorbed some of the traditional artistic methods that they were learning through discussions about their courses. During this same time, she was working on a series of book covers for Tor Books of New York and author Jane Lindskold. 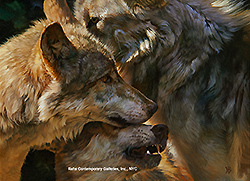 After the success of the first book, Through Wolf’s Eyes (2001), Bell visited the Lakota Wolf Preserve in New Jersey to photograph the animals directly. This proved to be a seminal experience for the artist. She was fascinated not only with the overwhelming experience of being personally close to the wolves, but also with how the animals interacted with each other. Since then she has been painting scenes of animals and humans interacting, trying to capture the sense of movement and emotion when the two individual beings communicate in non-verbal, but powerful ways. Wildlife and western art has become increasingly important in Bell’s oeuvre. Images of horses, bison, foxes and of course wolves, often depicted in a western landscape, now form a distinct part of her work. 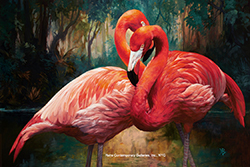 Likewise, more exotic species such as lions, leopards, zebras and flamingos have also become the subject of her paintings and drawings. 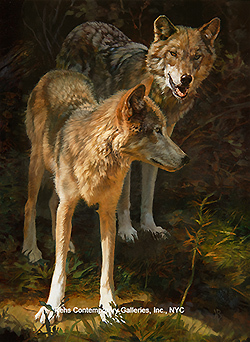 As Bell expanded the role of wildlife paintings in her work, she realized that there was room for more personal artwork as well as her commercial production. 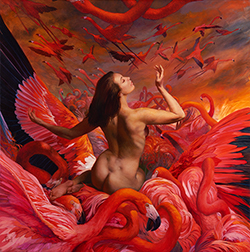 That transition has taken much of the last decade as she increasingly shifted her attention to painting imagined scenes that express an idea or an emotion in a realistic visual vocabulary. 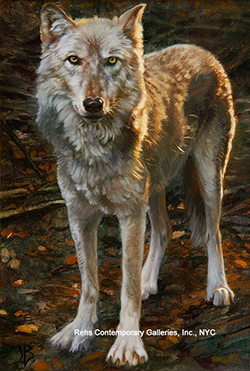 Bell’s role as a leader in the Imaginative Realism movement was confirmed in 2012-2013 when the Art Renewal Center International Salon acknowledged her with a first, third and fourth place prize in the Animal Category; a first prize in the Imaginative Realism category; a first runner-up in the Portrait Category; honorable mentions in both the Animal and Imaginative Realism Category; and three purchase awards in two categories. Two years later, she was named a juror for the Art Renewal Center International Salon. Also of note in recent years is the Denise McCalla Memorial Top Choice Award from the the Mountain Oyster Club (2015) as well as the Spectrum Fantastic Art Silver Medal (2016). 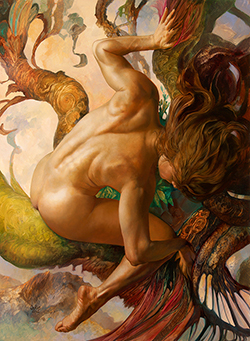 In September of 2016, she will be among a handful of artists included in the Imaginative Realism exhibition at the Delaware Art Museum, where contemporary work will be shown alongside Victorian painters such as Edward Burne-Jones and John William Waterhouse, as well as American Golden Age illustrators such as Howard Pyle and N. C. Wyeth. The museum curators are positioning Bell and her imaginative realist colleagues as the direct inheritors of the traditions represented by these earlier generations. 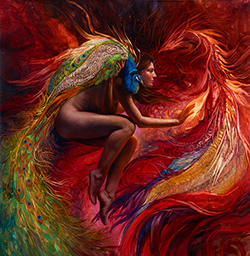 Looking back over a career that has already spanned over three decades, Julie Bell’s work is a study in sustained growth and evolution. Her understanding of the importance of emotions—and her commitment to expressing them ever more clearly—suggests that her art will continue to deepen over time. By: Janet L. Whitmore, Ph.D.